From the monasteries in Morias, the one of the Virgin Mary of Malevis should be noted, a Pan-Hellenic worship, of Saint Nikolaos Varson, of Saint Nikolaos Kaltetzon, the women's monastery of Kimiseos (Virgin Mary) in Elona, of Kimiseos (Virgin Mary) in Kernitsa, of Timiou Prodromou in Corinth, one of the most important male monasteries outside Agion Oros and of Metamorphosis Loukous. These monasteries present an important national offer, have rich heirlooms and an appreciable tradition and are built in wonderful natural places of Arkadia and Kynouria. In the region of Corinth, we can find the monastery of Holy Patapiou near Loutraki, the catholic of which raises on the cave where he lived, the women's monastery of Kimiseos (Virgin Mary) Faneromenis Hiliomodiou with beautiful murals by Dimitrios Kakava (1607) in the chapel of Saint Marina, the monastery of Prophet Elias Zaholi with important heirlooms and most of all, the male monastery of Saint Georgios ‘Feneou’ with an appreciable catholic and murals by Panagiotis of Epirus (18th century) and a temple of very good art (1762) that is reported mainly for its great contribution in the Revolution of 1821 and in the education of Greek people. In the region of Aigialias, the monastery of Taksiarchon that was founded during the Byzantine years, offers to the visitor hours of recreation and the occasion to admire important works of ecclesiastical art. It produces the excellent red - sugar, a sweat that is made by roses. 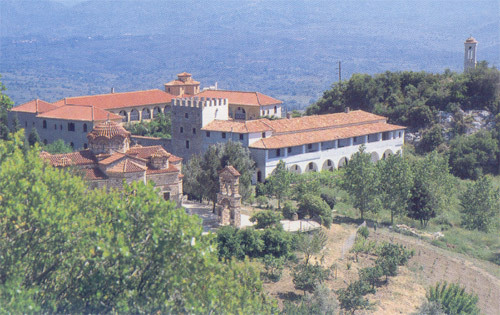 Memorable excursions – worships can also be organized in other famous monasteries of that region, as the one of Saint Laura, of Megalo Spileo and of Makelarias in the province of Kalavrita (marvelous iconostasis in the chapel of Saint Trinity) with heirlooms from the Revolution and ecclesiastic pieces of art, the women's monastery of Pepelenitsas and others. 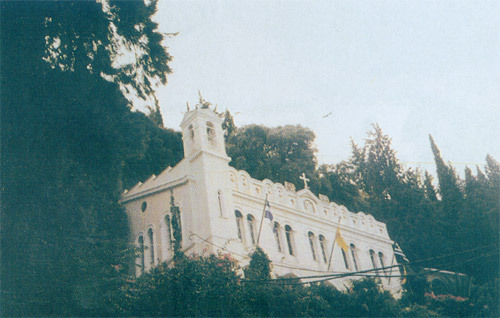 In Achaia, besides the monastery of Girokomio that is very beloved to the citizens of Patras, the monastery of Omplou with its important contribution during the years of Revolution and the women’s monastery of Saint Nikolaos Bala (old monastery), will astonish their visitors with their rich heirlooms and their intellectual life. 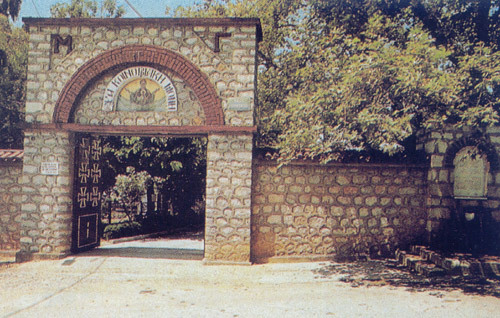 In the region of Ilia, we can find many important monasteries, as the one of Kimiseos Skagidias with an appreciable library and sacristy, the monastery of Vlahernon in Kilini (Birth of Virgin Mary) that was destroyed by Imbrahim Pasas but saves many things that remind us of its history, the monastery of Crisopigis, Ano Drivis, Eleousas Varthilomiou, Zoodochou Pigis Epitaliou, Kimiseos Poretsou and Kimiseos Kremastis, the graphic catholic of which is built in the rock. From the retreats in Arcadia, the one of Emialon in Dimitsana has a catholic dedicated to the Birth of Virgin Mary (17th century. ), painted around 1608 by Georgios and Dimitrios Moscos. 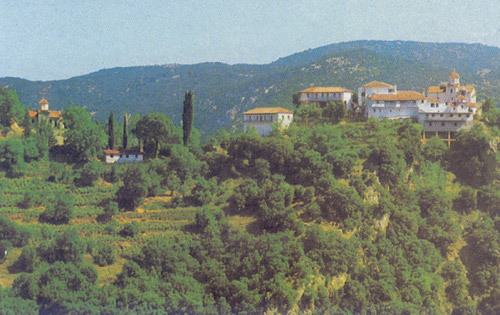 It is very important to mention the non-functioning monastery of Kimiseos Philosopher that Ioannis Lampardopoulos founded during the 10th century and is located near Dimitsana. Its catholic (1691) has appreciable folklore art murals (1693). Here, during the years of the Ottoman occupation, the kryfo scholio (hidden school) used to function, presenting important figures of the ecclesiastical and social life. In the region of Messinia, we should note the monastery of Kimiseos Voulkanou, where Dimitrios and Georgios Moscos worked (in 1608) leaving appreciable murals that were destroyed at the 10th century during the renovation of the catholic; however, several icons , heirlooms etc are saved. We should also note the monastery of Kimiseos Dimiovis, the catholic of which was painted in 1663 by Damaskinos Peloponnisios and has a wood carved temple that is a masterpiece (1773), the monastery of Zoodohou Pigis Pelanidias with important parchments at the Revolution of 1821 (the great personality of the hero Gregorios Dikeos- Papaflessas is a child of this monastery that today is a women’s monastery), the monastery of Timios Prodormos, a newer monastery in Pirgos Trifilias, etc. In the region of Lakonia, the women’s monastery of Kimiseos Zerbitsas is very interesting for its Byzantine and post Byzantine art, heirlooms, monastic life and natural environment (the catholic was built around 1639), as well as the male monastery of Saints Tessarakonta Martiron (the catholic was painted in 1620 by G. Moscos but his work suffered great deteriorations) and the monastery of Virgin Mary Giatrissa in Taigetos that people in Mani love in a particular way.